Coral World Ocean Park was one of the biggest highlights for me on our vacation to St. Thomas, Virgin Islands. 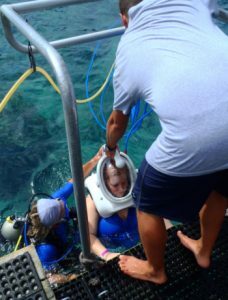 Like it says on their website, you get to “experience the beauty and magic of life under and above the Caribbean sea”. There is so much to do at Coral World so plan to spend an entire day there. 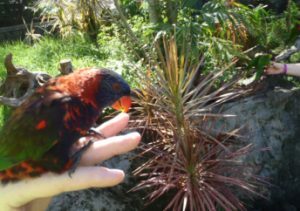 You can spend time in the Lorikeet Garden, an aviary where you get to feed nectar to the rainbow lorikeet’s. They eat it right out of your hands! There is a shark encounter, semi submarine, iguana alley, marine gardens and so much more. I especially loved the Stingray Lagoon where we were able to hand feed the stingray’s. Amazing creatures! And of course there are gift shops, food and even a beach. We didn’t make it down to the beach because we were booked solid that day with three of their major attractions. 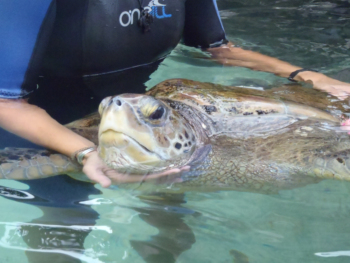 During this attraction, you enter a pool with two of Coral World’s rescued green sea turtles. You have the chance to touch their shells and feet and learn more about them and the challenges they face. They are such precious creatures. It’s so sad to hear how threatened and endangered they are worldwide! Erica, our guide was so knowledgeable and has a huge passion for what she does. The highlight of my day! Meet and bond with one of Coral World’s sweet and loving sea lions. 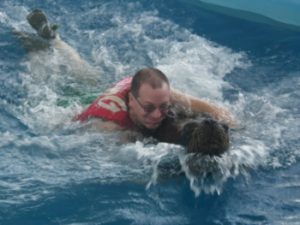 You’ll get in the pool with a sea lion for some fun and educational interaction. Omar, the sea lion we got to bond with was awesome. We got to touch, dance and play games with Omar and I LOVED it. Ashley and a second trainer were so much fun and did a great job working together and with us to make it the best experience ever. The Sea Lion Swim experience was something I’ll never forget. Words really cannot even describe it. Sea Trek was also a really cool experience. This is a guided underwater tour where you follow a handrail around the ocean floor as you see a variety of marine life and get to touch some of it as well. You wear your bathing suit (obviously), water shoes and a Sea Trek helmet that weighs 75 lbs. This helmet provides you air, weight and stability. There are also two tour/safety guides with you the entire time. They usually offer a high definition video to purchase but they didn’t have it available that day so Kevin used our underwater camera to take video of the experience. You can see our Coral World Sea Trek video on our You Tube channel. 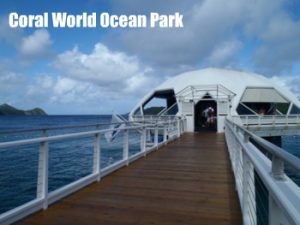 The above attractions should NOT be missed the next time you go to Coral World Ocean Park, St. Thomas, Virgin, Islands. You can tell that ALL of the Coral World employees really love their job. We want to give a big shout out to Kenan, our tour guide, Erica, Ashley, Kurt, Ross, Lance, Jackie, Dekisha, Khalidia and everyone else who made our time at Coral World one we will always remember.